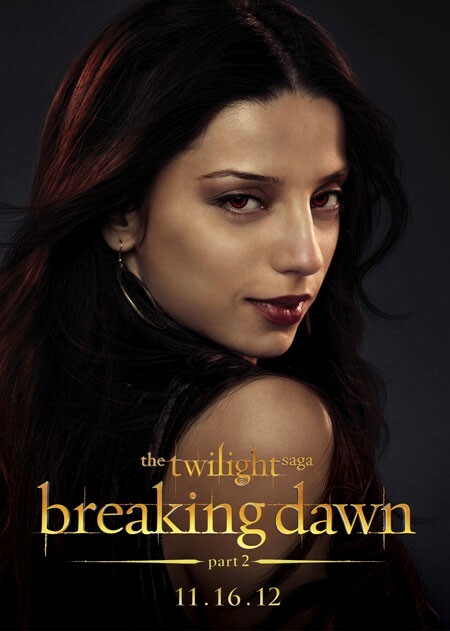 Here is all you ever wanted to know (and we know how much you’ve been wanting to know) about Angela Sarafyan who plays Tia in Breaking Dawn Part 2. Does anyone get the feeling we’re gonna be REALLY CONFUSED with all these new characters while watching Breaking Dawn Part 2? Should we bring our Edward Cullen notepads to take notes during our first viewing? What if they give us all a Twilight fan test at the midnight showing after the movie is over? I will fail SO BAD. With Stephenie Meyer being on the set did you get a chance to talk with her and get any new insight about your character Tia? Angela: I did. I did get a chance to talk to her. We actually spoke briefly about how she cam up with the character. And I don’t even know if it’s really coming up with but there’s just a little bit of a talk about how Benjamin and Tia came from poverty and kind of struggled until the met Amun and Kebi. It was interesting to hear her perspective on the character. Was it nice having her there? Angela: Ya, of course, it was kind of cool. It was like having a legend on set in a way. Because she wrote all those books and she came up with those stories. And then to actually meet the person that did that, that was kind of surreal. It was kind of surreal to be on that set in general. How did you prepare for your role once you got cast? Had you read the series before hand? Angela: No, I hadn’t read the series beforehand. Actually how I got ready initially was I saw the third film before my audition and was readying all your sites actually about everything twilight. Because I had a short time to get ready for the audition so basically it all started from you guys. There is so much information that you put out there. I felt fortunate to have all the sites available. After I heard I got the part, I had briefly read summaries of the books before the audition, then after that I read it. I read the full book and completely saw all the movies, and got a sense of the world I was coming into. I was wondering if you could tell us what it was like seeing yourself in full out vampire gear the first time. Angela: I didn’t know what it was going to look like. It was trippy. It was, I don’t look anything like that. I was really cool because I don’t look anything like my character in the movie at all. From my hair to my makeup, to the clothes that I wear, I don’t look anything like it. I even think I look, there’s this picture out now of all the vampires, and I don’t even think it looks like me. That picture, she looks Egyptian. It’s crazy that this transformation happened. It was cool to finally play a character that didn’t look anything like me. I was wondering, since you are Egyptian do you use an accent or how you make your voice a little different? Answer: Nothing was different. There’s a slight accent, but everything was just really subtle and real. Also with our looks we’re really different from the other vampires. Just so you know. We are all golden. We are not white. Being Egyptian, that is one of the things that stood out. We look really good. So there wasn’t anything too extreme about it. Which I liked. I think it kept it real. As real as a vampire is. What was it like coming into such an established set? What was it like to feel like the new kid? I think that I had that experience initially, but what’s interesting is that there was so many of us that we became the people that everyone else was gonna try to fit into. There were so many vampires and so many actors there. Initially it was… I am trying to think of the correct word because the very first scene that we shot was at the Casbah , and I remember just going on that set and seeing Elisabeth Reaser and their faces that I’d seen posters of and these faces that I’d seen in the films. I couldn’t digest it. I couldn’t look at it and go oh whatever, who cares, they are just actors, it was surreal. The whole thing was completely surreal. I remember I came on set the day before we were shooting, or two days before, and I saw Kristen sitting there, and I was like that’s the girl. There’s the face that I’ve been seeing and hearing everywhere. There’s that little head. It was interesting to finally see them in the flesh. It was not as intimidating as you think. Just a very crazy thing to see these things for real. When you came into this, who were you most excited to work with? Angela: I was looking forward to meeting Rami because he was going to play my man. I know technically I should be excited to meet Kristen and Rob and all those cats and I was happy to meet them, I really was, but I think that most excited about it was meeting Rami because we were going to be mates, as vampires can be. We were mates. I didn’t know who he was and it was a lovely surprise. It was just a great surprise. I think when you see the film, you will think that we are a couple, which is cool. We really found what was special between us. Whose idea was the photo pose for the EW Comic Con photo booth? Angela: It just happened. Nobody had an idea. I went and I stood there and we didn’t know what to do. It just happened. Angela: Thanks, I love that picture too. What was the most challenging part of playing this role? Angela: I don’t think it was challenging actually. I didn’t find it to be very challenging. I kinda just took everything from one moment to the next. I don’t know, I would think that the right answer was that it wasn’t really challenging, it was fun. It was interesting and fun to approach based on the world that was being created. If that makes any sense. Because I didn’t know really what I was walking into, so everything was kind of created in the moment. I had ideas, but those ideas can be thrown out the window once you walk on a set, and you see what’s really going on. So then you create in the moment, which makes it more exciting. It wasn’t a challenge, so it was more fun than difficult in any way working on this part. Creating real relationships and building the characters from there. I guess, ultimately. And there were pleasant surprises along the way. There are pleasant surprises because you don’t know who you are going to meet. So when you have connections with other actors, like Kristen and I and Rob and Rami and Omar and a lot of us had real connections. People had real chemistry. It was surprising that those things happened and I was happy for them. And you create friends as well. Bet you didn’t know all that, right! ?